It's been just over a month since Google announced that they were killing Google Reader and the replacements are still coming out of the woodwork. Digg has previously shared plans to launch a Google Reader replacement, and they have been studying which features that current GR users wanted the most. This social reading developer posted a few new hints today drawn from their latest user poll. Over 8,600 readers participated in this latest poll, and Digg found that over 75% of respondents preferred to share links and content by email. 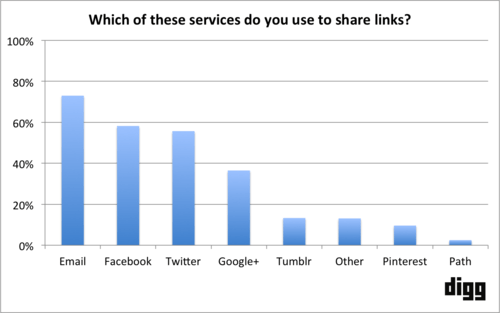 Email was the most popular sharing option by a significant margin, with Facebook and Twitter coming in second and third, and Google+ a distant 4th. Digg is naturally going to make sure that the 3 leading options are included in the beta launch of their news reader. 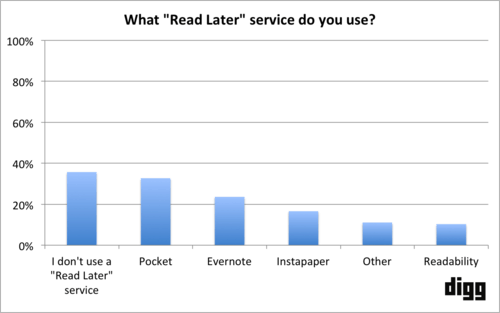 Next, the survey showed that over a third of the 8,600 respondents don’t use a “save for later” service, but for those who did Pocket, Evernote, and Instapaper were the 3 most popular options. Digg plans to support them all. Evernote is more of a note-taking service than a reading service, so I was a little surprised to see that it was more popular than Instapaper and Readability. 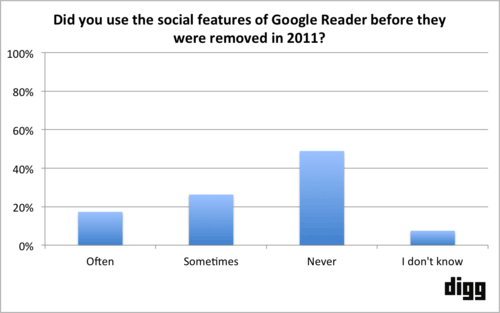 A later survey question revealed that nearly half of the respondents indicated that they had never used the social features of Google Reader, and only 17% said that they had used them often. The lack of interest seems to have moved social reading down the list, though it does not seem to have affected the sharing features (which were obviously quite popular). This graph is especially interesting because it shows that a significantly percentage of readers shared stories but weren't social readers. That's an interesting distinction, is it not? It's like saying the readers don't want to chat about everything they're doing but they do want to let other readers know what might worth reading. That's very different from what a lot of the social reading platforms assume, and in fact it is closer to what I do every morning in the Morning Coffee posts. Digg's news reader is expected to be released in June as a beta test. It will be free during the beta but Digg is looking at the possibility of offering a paid product. Thank you for staying with this. I really appreciate the work you have put into helping the rest us find a replacement for GR. It is the one Google product that I haven’t found a satisfactory substitute for. I’ve been using The Old Reader but I’m still not sure it’s going to be the answer for me if for no reason other than I have to sign in with a Google account.